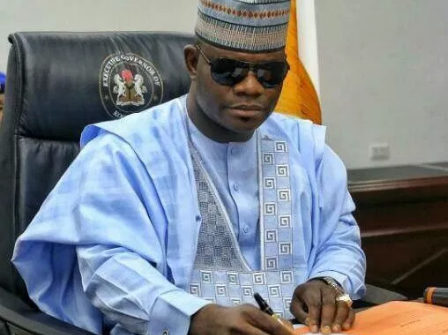 The people of Kogi State were left in confusion after Governor Yahaya Bello announced the sack of 15 commissioners and the 21 chairpersons of the local councils in the state. But however in less than an hour another announcement was made stating that the commissioners and local council chairpersons have been reinstated. Although no one has come out to say anything yet to explain what really happened, however according to a reports the Governor has announced the sack of the commissioners just to see how they will react and also to test their loyalty. According to a Punch's correspondent, other Sources close to the cabinet meeting held behind closed door on Sunday told he that the dissolution might not be unconnected with the arms importation last Thursday. The Governor was said to be angry with his cabinet members, whom he accused of leaking the information about the arms importation. The Director General, media and publicity to the Governor, Kingsley Fanwo, confirmed that the governor had withdrawn his order of dissolution and asked them to return to their position. It was also gathered that the reversal might be at the instance of the Chief of Staff to the Governor, Edward Onoja, who reportedly urge Bello not to toe that line. Onoja, is said to be a very powerful and influential member of the Bello’s cabinet, was quoted as arguing against the dissolution, especially as the governor would need them for the realization of his 2019 re-election bid. “He told the governor that it would be difficult to build a new set of loyalists that will be used for campaign” a source said.